SHODO is one of the oldest and profoundest traditional forms of arts in Japan, developed and appreciated since 5th. Century.The world of calligraphy has its long rich history which went through many possible calligraphic styles and expressions during its over 3000 years existence.SHODO is by all means a highly regarded art – skilfully and aesthetically. The depth of beauty in SHODO is the result of diverse techniques being accompanied with a flow of brush and ink, and essentially with an inner silence/stillness and spiritual concentration.“SHODO” is indeed a Japanese word which is often translated and described as “the way of artistic hand writing or beautiful writing”. It is written with 2 Kanji characters. It is ancient art separated from any other creative work. And it differs in that its main focuses are simplicity, beauty, and – most importantly – a mind-body connection. The true calligraphy is achieved by applying the elements of art, specifically line, shape and space. Sounds easy and it may seem uncomplicated or even bland to the common eye. 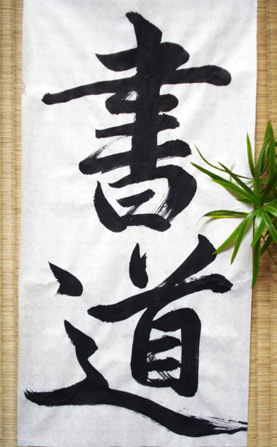 But believe me – the mastery of all the elements of art and skills needs a lot of practice and connections with yourself.What I found most difficult for learners is to have a MUSHIN 無心 : the state of no-mind, non-thoughts, a high level of spirituality and a heart free of disturbances. You can describe this as meditative state. Besides practicing Shodo for many years, we learn to focus intensely and become one with the meaning of the characters in the text. In order to do this, one must free his/her mind and heart of disturbances and focus only on the meaning of the character. Becoming one with the moment and what you are calligraphy-ing, essentially, is the core philosophy of Shodo, influenced by Zen Buddhism. I found it always very interesting to see what I have done or my students have done- it is like a mirror of your KOKORO, the moment of flow, and it is never the same. And the ink never lies!! Whatever the result, the process of doing SHODO always leads you to a peaceful mind.